My Hero Academia Vol. 18 Review – AiPT! Kohei Horikoshi’s My Hero Academia Vol. 18 came out recently, and it signals both an ending and a beginning. 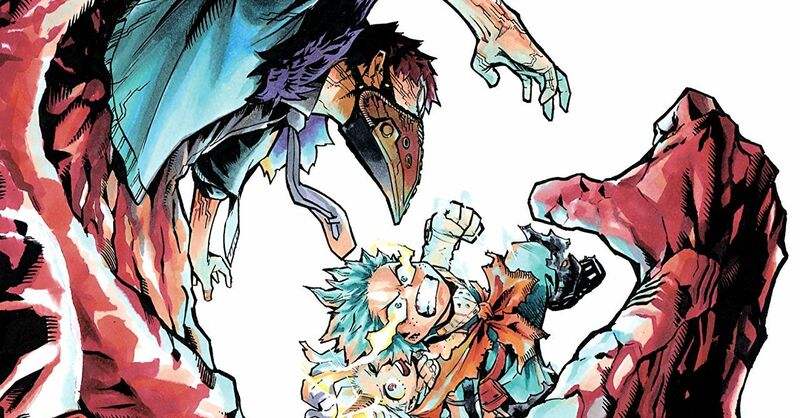 The first half collects the remainder of the fight against Overhaul, followed by theheroes coping with the dramatic changes it makes to the status quo. After that we get a mini-arc about Bakugo and Todoroki’s provisional hero license training, and the very end kicks off a mini-arc centered around Aoyama. There are lots of characters and plot points vying for page-time here. Does Horikoshi juggle them all effectively? Is My Hero Academia Vol. 18 good? The Overhaul portion of the volume is a mixed bag. On the bright side, the art is mostly stellar. Horikoshi’s knack for visual flow is still going strong as he depicts precisely the right moments in time to convey the massive impacts of characters’ blows. Take for instance a sequence of two panels where, at the bottom of one page, we see Midoriya going into a kick just before he hits Overhaul. Then the next page is a single large panel of Overhaul getting flung through the sky. Moments like these really show just how effective (or in other instances, ineffective) characters’ decisions are. The car chase scene with Shigaraki and the League of Villains evading the police is also very well-done and successfully conveys a type of drama that’s often difficult to pull off outside of action movies. On the downside, these segments have some issues with clarity and character work. The visuals aren’t confusing very often, but the clunky moments tend to happen in the middle of otherwise great scenes. It’s disappointing to be reading your way through a great battle and have action music playing in your head just to have the flow of events thrown out of whack by an awkwardly composed panel. Overhaul’s character arc is also a bit disappointing in its execution. He has unique goals and motifs and he’s pleasantly different from the League of Villains, but the backstory we get for him isn’t very well fleshed out. He clearly has strong emotional attachments to his superiors, but this is told more than shown and ends up feeling less impactful as a result. Fortunately, the character development in the rest of the volume is much more successful. The aftermath of the Overhaul battle includes some poignant scenes for Midoriya and Mirio. Mirio’s are especially touching and provide ample opportunity for Horikoshi to show off just how skilled he is at drawing facial expressions. He’s not afraid to let his characters ugly cry with clenched teeth and snot, as well as tears streaming down their entire faces. Midoriya also makes some fantastic faces here, though his often capture much more subtle nuances of feeling. The mini-arcs are also quite enjoyable. Bakugo and Todoroki’s provisional license training is a nice tonal shift from the serious Overhaul battle. They have to work with a bunch of unruly children, resulting in both comedy and sincere reiterations of why heroes are so important to society. The tense interactions between Todoroki, Endeavor, and All Might in this section are also fantastically written. The Aoyama mini-arc kicks off hilariously as well. There are a lot of candid close-ups on characters’ faces that channel both comedy and horror. Overall, My Hero Academia Vol. 18 is yet another great installment in the series. The Overhaul arc concludes with more highs than lows, and the mini-arcs are excellent follow-ups in terms of adding levity. The art is also consistently strong throughout with very few weak points. This continues to be one of the best superhero comics on shelves right now. My Hero Academia Vol. 18 is yet another great installment in the series. The Overhaul arc concludes with more highs than lows, and the mini-arcs are excellent follow-ups in terms of adding levity.